The WingdowTM Seat - is a perch for pet birds specifically designed for use in the window or your home or office. It protects windows from soiling and chewing, and provides a place for your bird to sit that is safe from cold drafts in winter. Birds climb or fly to it because it rests in the middle of the window where birds would normally land. Allows your bird to enjoy the view outside which is good entertainment. 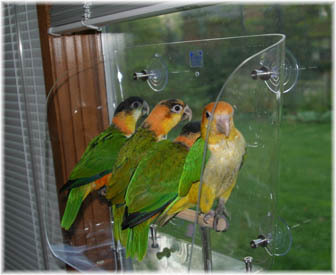 The Medium size is appropriate for smaller medium size birds such as: Conures, Caiques, Cockatiels, Senegals, Meyers, Pionus, Quakers, or other birds of equal or smaller size. When ordering please indicate the species of bird(s) that will be using the Wingdow Seat so an perch with appropriate diameter can be included. Attaches to the interior of almost almost* any window with 6 suction cups and rests on rubber cushions to protect your woodwork. (*) WingdowTM Seat is designed to fit any convention wooden double-hung window, but will also work with other similar applications (see Technical Drawing below). Manufacturer recommends using the largest size your window and pocketbook can accommodate, but be sure to choose the right size perch. Select perch size on Option List. Please note this shipping information: Box dimensions and weight are factored together to determine the cost to ship this product. The Shopping Cart is unable to combine these factors so shipping cost must be determined after your order is submitted. Upon submission the shipping cost will be determined and we will notify you of the shipping cost. If approved, your credit card will be charged for your order along with a separate charge for shipping.